ITa��S BEEN 52 years since the original American muscle car made an entry. From its first screen appearance in the 1964 James Bond flick, Goldfinger, to its most recent avatar as Barricade, the evil Decepticon from the 2007 Transformers, the Ford Mustang has a mean reputation to live up to. Ita��s taken over half a century for Ford to sate its Indian fans with a right-hand drive version and ita��s been every bit worth the wait. After our spin on the Buddh International Circuit in the all-new Mustang, we list down our favourite things. Under the hood of this galloping pony is a stonking 5.0-litre V8 petrol engine, churning out a lethal 401hp and a turning force of 515 Nm. All of this power can be put to the road with the slick Select Shift six-speed automatic transmission, with speeds up to 250 kmph at your disposal. But you dona��t need numbers to convince youa��start the engine and the iconic growl says it all. Ford has kitted the new Mustang with electronic line-lock, which locks the front brakes and allows the rear wheels to spin independentlya��to warm up the tyres at the backa��for a smooth, drag-racer-like launch. 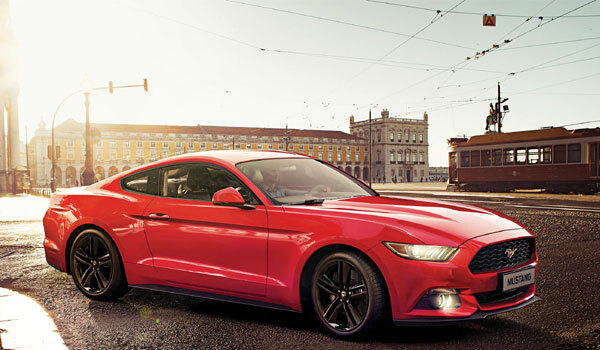 While the classic long-sculpted bonnet and trapezoidal grille help the new Mustang retain its iconic appeal, new elements add a contemporary touch. Most prominent of these are the three-dimensional, tri-bar lamps, lending a mean look to the front. Forda��s MyKey provision allows owners to limit top speed, audio volume and keep driver assist systems activated, when handing the keys over to someone else. A mighty useful feature and quite indispensable for a car as exciting to drive as this. Ford will be assembling the right-hand drive versions of the Mustang at its Flat Rock Plant in the US. Considering that it will be shipped here as a completely built unit, ita��s rather competitively priced at `66.1 lakh (ex-showroom, Chennai). All the competition in this range is considerably lower in power and engine capacity. Then again, there is nothing quite like a Mustang.